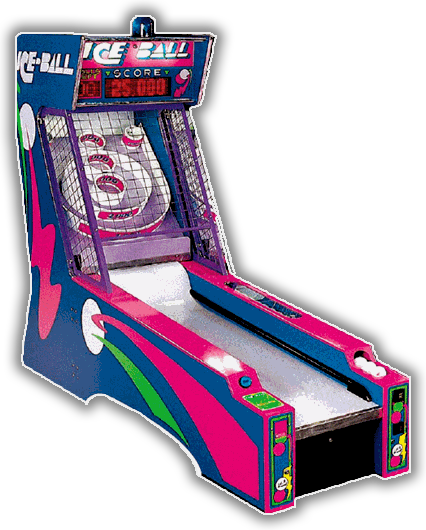 ICE’S revolutionary version of the traditional alley roller. ICE was designed with unprecedented durability and serviceability in every area of the game. This 10 ft. alley has a remarkable number of great features. The materials used in ICEBALL are far superior to any other alleys. ICE uses a vinyl material for the alley itself, it is attractive and more importantly, easier to clean. Scoring is accomplished by using optical sensors in the target area, instead of the problem prone micro switches. Also you can adjust the point scoring levels with the push of a button. Even the balls in this machine are unique taking on the appearance of actual balls of ICE, they are made of a durable polypropylene plastic which is easy to clean.